EMI Label Services are proud to announce the release of Sacred Mother Tongue’s brand new EP, the monumental ‘A Light Shines...’. This is their debut release on EMI Label Services and precedes their second album, ‘Out Of The Darkness’, which will be released early next year. ‘A Light Shines...’ is a defining moment for Sacred Mother Tongue, their stake in the sand as one the most exciting bands in British metal. Opening with the powerhouse chorus and heavy-as-hell guitars of ‘Evolve/Become’ and followed by the thumping darkness of ‘Seven’, it’s instantly apparent that SMT have made a quantum leap on from their well-received debut album ‘Ruin Of Man’ in 2009, from which they reinterpret ‘A Final Idea’ as an acoustic number on this EP. And now, Sacred Mother Tongue in 2012 are channelling the melodic power of Metallica, the dark demons of Alice In Chains and the visceral intensity of Machine Head to create a vital update of all these influences coupled with a whole heap of skyscraping ambition. And it’s that ambition that saw them head to China last month on tour, from which comes the final track, ‘City Is Crying’, another new song which received its live debut on those foreign shores. The band play their first UK show in support of ‘A Light Shines...’ on July 5th at The Intrepid Fox in London’s West End. With a live show of quite spectacular proportions in the works this is a must-see showcase where Sacred Mother Tongue will unveil many of the tracks from the forthcoming album ‘Out Of The Darkness’ in a small venue, ahead of a full headline tour later this year. 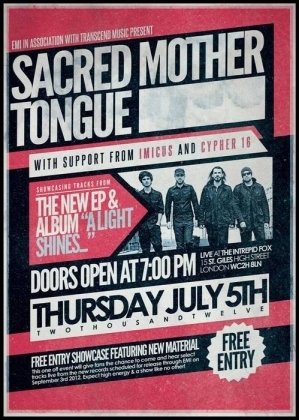 This is a one-off free gig and support comes from Cypher 16 and Imicus. Sacred Mother Tongue’s stunning sonic arsenal features the bruised power of vocalist Darrin South and guitarist Andy James, whose six-string skills have gained him worldwide acclaim both from his peers and on YouTube where his guitar tutorials now have over 4 million views. Completed by Josh Gurner on bass, famed for his stage-diving antics whilst still shredding the fretboard, and drummer Lee Newell, who is also the rhythmic powerhouse behind Fields Of The Nephilim’s live performances, Sacred Mother Tongue are renewed, revitalised and ready to take on the planet.